Aquacal HeatWave SuperQuiet Heat Pumps are AHRI certified and fully factory tested before shipping. 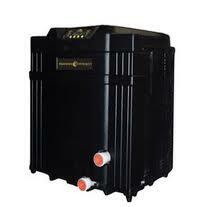 The HeatWave Superquiet heat pump contains a pure titanium heat exchanger and R410A Refrigerant. The primary cause of premature heat pump demise is the failure of the heat exchanger. Ordinary heat exchangers are made from a cupronickel alloy. This cupronickel material is susceptible to attack from the sanitizers used in pools and spas, and from other related water chemistry conditions. Once the heat exchanger fails, the heat pump is ruined. The ThermoLink Heat Exchanger tube is made from pure titanium, and is virtually impervious to water-chemistry damage. – ThermoLink Heat Exchanger – The primary cause of premature heat pump demise is the failure of the heat exchanger. Ordinary heat exchangers are made from a cupronickel alloy. This cupronickel material is susceptible to attack from the sanitizers used in pools and spas, and from other related water chemistry conditions. Once the heat exchanger fails, the heat pump is ruined. The ThermoLink™ Heat Exchanger tube is made from pure titanium, and is virtually impervious to water-chemistry damage. – Scroll Compressor – Super efficient, heavy-duty and quiet operation. – Microprocessor Computer Controls with Digital Thermostat – Consumer friendly technology instantly provides total comfort control using large easy-to-view digital L.E.D. status readouts and water resistant keypad, combined with a state-of-the-art microprocessor and dual thermostats. – Corrosion Proof Cabinet -; UV treated high-impact plastic cabinet is impervious to deterioration with an easy access panel for cleaning and servicing. Rust proof, fade proof and crack resistant. – Off-Set Plumbing – For easy installation. Shipping Weight 349 lbs. 336 lbs. 336 lbs.